I upset a lot of ants yesterday. It probably amounted to several nests full and that adds up to a lot of grumpy critters. This wasn’t done intentionally, you must understand. I was quite innocently going about my business pulling weed out of a wall, as is my remit, when my unwitting faux pas occurred. Little did I know this was not any ordinary wall, it was an ant metropolis, and the citizens were not happy. Although I am not an expert in these matters I guessed by their reaction (the squirting and the nipping) they were indeed livid. Risking their further wrath (from a safe distance) I took a few moments to study how they reacted to the blundering giant’s destruction of their home. It was mesmerising to watch Ant Emergency Procedure (Invasion) being put into action. To see how they efficiently mobilised their troops, some to ward off their attacker (little old me) and some to rescue the enormous eggs. Nature is truly a wonderful thing, shame about the Blundering Giants. I did the same thing yesterday while trimming back the flocks of phlox (otherwise the lawn guy’s string trimmer will get them) from hanging over the stacked-stone raised bed ‘wall’. Most of the residents were sowbugs but there must have been an ant nest in one of the cracks. They are very impressive in a slightly scary way, don’t you think? So easily done and I hope their attack was not too painful, nature is so wonderful that I bet they are back to ‘Home Sweet Home’ by now. No, but I quickly moved out of the way! This dry weather is perfect for them. They are amazing creatures! Lately I am struggling to make them ‘move’ a bit out of the way from our brick patio, because we have our place for sell and doesn’t look well to see ants around (notice I am not saying ‘destroy’ ’cause I think it’s impossible). I hope there is no such thing as ‘ants hell’… (that’s where I would end up). I had sent a letter to my MP concerning the imminent demise of bees and pollinating insects and was feeling in need of succour and comfort so I turned to on/off theedgegardening only to find pain, wrath and destruction. However I’m a ‘silver lining’ person – it complemented my mood and I thought ‘there’s always the archive’ ! Oops, sorry about that ! There is cake and echiums in the next one. You can also feel good because you have done something positive by writing the letter. At a certain time of the year they seem to pop up all over the place, it seems with every fork you find a nest. I thank my lucky stars that all our creatures in this country are relatively harmless, sure that in certain parts of the world gardening is a more dangerous occupation! 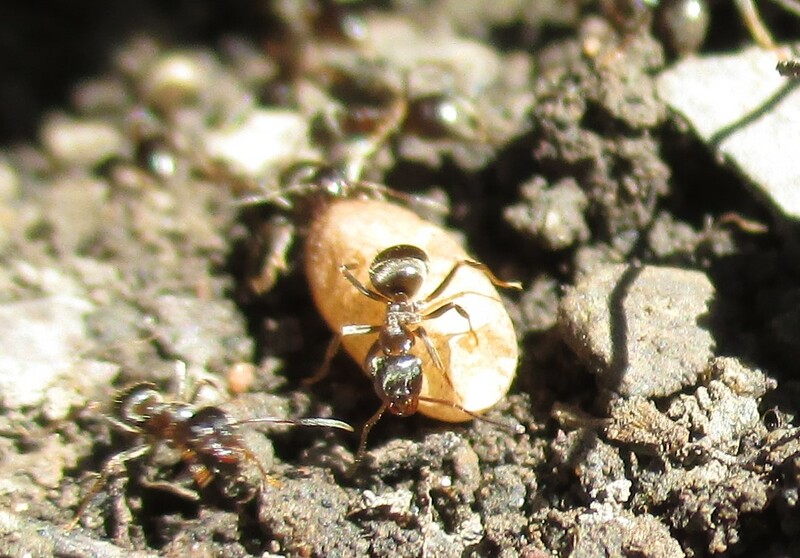 We have some ants here that run up your legs and bite you for no good reason: you don’t know they’re there until it’s too late and it seems very spiteful behaviour because you didn’t disturb their nest. They cause the most painful welts and itchiness. Oh I don’t like the sound of them! Very grumpy.